The Bruarfoss in Argentina, Newfoundland. A Newfoundland longshoreman named Clifford stands on the the deck of the Bruarfoss as it prepares to move containers in Argentia, Newfoundland. Clifford, a Newfoundland longshoremen in Argentia, Newfoundland. Ragnar Agnarrson, 2nd mate aboard the Bruarfoss, is on watch in the bridge. Olafur Bjarnasson keeps a look out for icebergs as the Bruarfoss sails along the north coast of Newfoundland. This is a photo of the radar screen of the Bruarfoss as the ship travels along the north coast of Newfoundland. Several large icebergs are within six nautical miles of the ship. They appear as radar white blotches on the radar. An iceberg floats outside the entrance to the harbor at St. Anthony, Newfoundland. St. Anthony, Newfoundland, is located in the far northwestern corner of Newfoundland. It’s a remote fishing hub and service center for western Newfoundland and southern Labrador. An iceberg, seen at the top of the photo, floats outside the entrance to the harbor. Captain Gestur Helgason guides the Bruarfoss into St. Anthony, Newfoundland. 1st Mate Thorvaldur Hans Thorvaldsson communicates with Captain Gestur Helgasor as the Bruarfoss approaches the dock in St. Anthony, Newfoundland. Hjortur Gudmundson, chief engineer on the Bruarfoss, monitors the performance of the engine. Hannes Gudlaugsson is the cook aboard the Bruarfoss. Kristján, who joined the Bruarfoss as chef when the ship reached Reykjavik, has worked in restaurants and hotels. He says he prefers working at sea. Cargo aboard the Bruarfoss after stopping in Reykjavik, The white containers are refridgerated and contain frozen seafood. The trucks are bound for Europe. Gudmoder Halldorsson hoses down the deck of the Bruarfoss as it sails from Newfoundland to Iceland. The Bruarfoss sails along the northwestern coast of Iceland. The Bruarfoss sails along the west coast of Iceland. 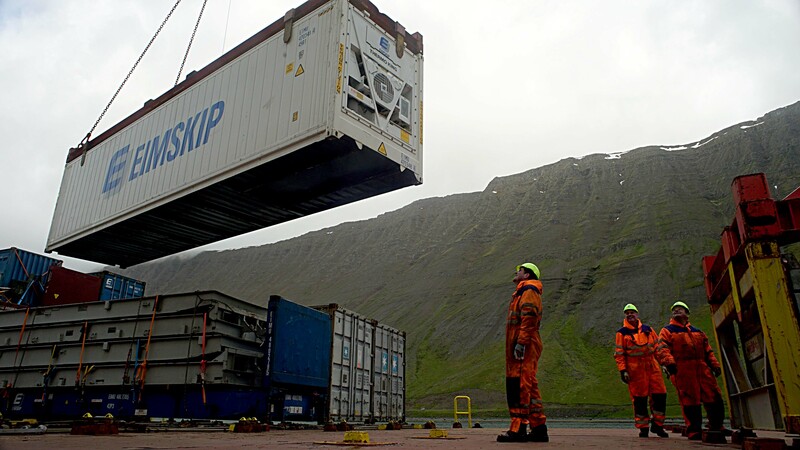 The crew of the Bruarfoss loads a refrigerated container packed with frozen fish. The Bruarfoss is in Isafjordur, a small port on the northwest coast of Iceland. he crew of the Bruarfoss loads a refrigerated container packed with frozen fish. The Bruarfoss is in Isafjordur, a small port on the northwest coast of Iceland. Eimskip’s freight yard near Reykjavik is a busy place. We said “goodbye” to the Bruarfoss when it stopped in Akureyri, the ship’s last port of call in Iceland before sailing to England and then Rotterdam. Located on Iceland’s north coast, Akureyri is Iceland’s second largest metropolitan area, with a population of just over 18,000 people. A residential street in Akureyri. Sheep graze the shadow of the ice-covered Snæfellsjökull volcano in western Iceland. Kirkjufell (Church Mountain) is a cone-shaped mountain in the Snaefellsnes peninsula in western Iceland. This mountain is partly owned by Hjortur Gudmundsson, the chief engineer on the Bruarfoss. A view of Reykjavik from the steeple of the Hallgrimskirkja church. Bruarfoss 2nd Mate ‎Ragnar Agnarsson and his long-timer girlfriend Margrét Esther Erludóttir show Ihila the view from a highpoint over the Reykjavik..
Iceland may be the land of volcanos and glaciers, but this stand of birch trees reminds me of Maine. Ihlia and her Mom, Svetlana, take in the scenery on the Snaefellsnes peninsula in western Iceland. Ihila relaxes in a stream heated by hot springs near the town of Hveragerði in the Reykjadalur Valley. We traveled here from Reykjavik on two pubic buses. Ihila jumps through steam products by hot springs near the town of Hveragerði in the Reykjadalur Valley. We traveled here from Reykjavik on two pubic buses. Ihila jumps near the town of Hveragerði in the Reykjadalur Valley. Ihila flying over Mount Esja. Ihila flies above Reykjadalur Valley. Ihila sits on the grass near the president’s house outside Reykjajvik. Fact: Iceland is really good at making ice cream. On the southwest coast of Iceland.